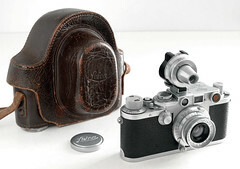 The Leica IIIf was Leitz's (later Leica) first 35mm camera body for screw mount lenses with built-in synchronization. 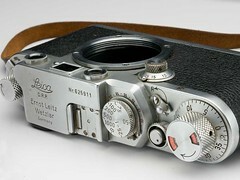 It succeeded the Leica IIId, which was a rare variant of the Leica IIIc. Built-in synch means that, unlike its predecessors, the IIIf didn't need an optional rework for flash photography. But flash synchronization still needed an extra adjustment, a contact number between 0 and 20, which depended on the type of flash bulbs used. That was necessary since different types of bulbs needed different flash firing delay times for exact synchronization. 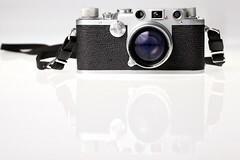 The camera has a coupled rangefinder and a viewfinder designed for use with a 50mm lens. 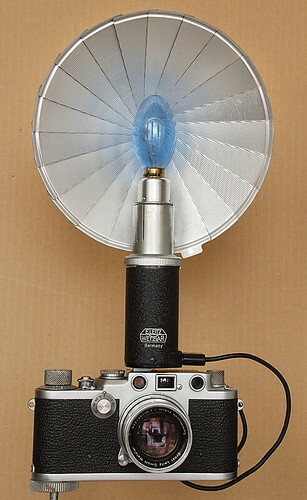 The camera has an M39 lens mount and cold shoe flash mount. 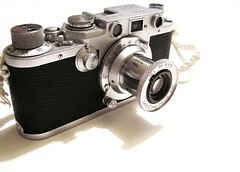 The camera appeared on the market in 1950. 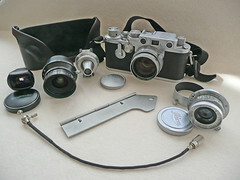 The Leica IIIf cameras are known as either Black Dial or Red Dial depending on the color of the engraved numbers on the syncronization dial. The original IIIf had black numbers. 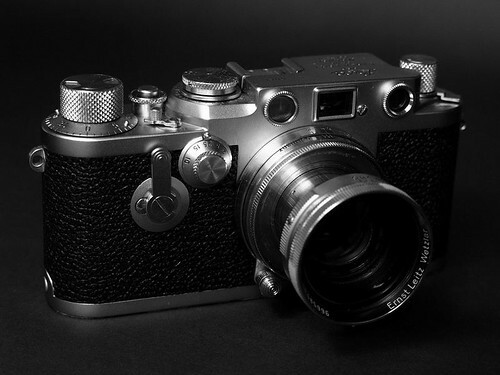 In 1952 or 1953, an upgrade to the shutter and flash sync system was carried out and the numbers were changed to red to indicate the new version. On the Red Dial version, the camera included better, more reliable shutter and had an improved flash sync speed of 1/50 of a second vs 1/30 of a second on the Black Dial versions. It was further upgraded with the addition of a self-timer in 1954. Serial number range: BD 525,001 - 611,000. RD 615,001 - 685,000. RD-ST 685,001 - 825,000. A total of 5,367 cameras were assembled in Ontario, Canada. 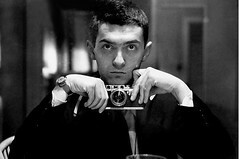 Stanley Kubrick took a famous self portrait in a mirror using this camera while working as a staff photographer for LOOK Magazine. The photo is now part of the LOOK Magazine Photograph Collection residing in the US Library of Congress. ↑ P-H van Hasbroeck, The Leica, (Sotheby 1983; ISBN 0-85667-171-1) Page 99. Opening a Screwmount Leica (IIIc or IIIf) for service at Rick Oleson's site. This page was last edited on 22 March 2019, at 01:49.